I am trying to query Customer table but it never opens for me in datasheet view either double-clicking the table or running a query - no error message is ever returned but the screen maintains an hourglass and the Title Bar of the Access Application says Not responding. 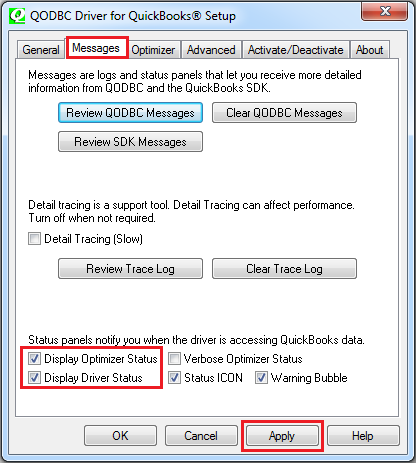 Please enable QODBC status panel via QODBC Setup Screen->Message Window->Select "Display Driver Status" and "Display optimizer Status" options. After enabling status panel execute the query again, if you see “Waiting for QuickBooks”, it means QuickBooks is taking the time to process the request. There will be a status panel at the lower right corner of your screen, will be shown a window with information on what QODBC is working at. Also, You may face this issue If your company file contains a large number of records in CustomerShipToAddress. Sometimes, because of the large record sets being used, the Iterator or Chunk Size in the Advanced Tab in the QODBC Setup Screen should be setup up to accommodate the largest returned record set. The default is 500, and it can be set to any value up to 100,000. To resolve this issue, Please download & install QODBC latest version V320 or above by clicking here. 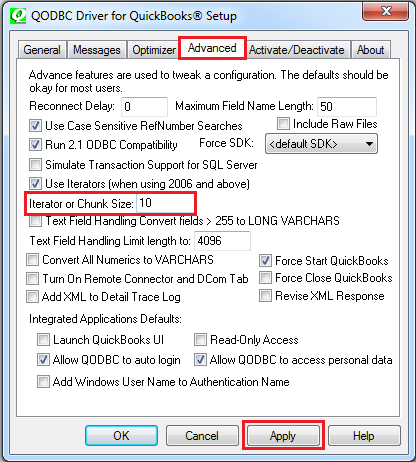 After downloading latest QODBC version, please change iterator chunk size to 2/10/50/100 on QODBC Setup Screen->Advanced tab. After changing chunk size please query customer table again. You should able to get records in the Customer table.